Duct Cleaning - Why It’s Important - MacFawn Enterprises, Inc. Your HVAC system is a circular system meaning air is blown out of the system, through a duct system into rooms, then pulled back into the system through a filter. Such air exchanges are important for maintaining favorable indoor air quality (IAQ), but a neglected HVAC system leaves opportunity for poor IAQ and potential health concerns. Although homes and businesses can be cleaned regularly, there is always a chance for allergens, dust, pet dander, microbial growth and other bacteria to sneak through and negatively impact the IAQ. If moisture becomes present the potential for microbial growth (e.g. mold) is increased and spores from such growth may be released into rooms through the ducts. Some of these pollutants may cause allergic reactions or other adverse health symptoms in people if they are exposed to them. Although air pollution in the indoor environment is a growing concern, many people forget the dangers that can occur within this system, including the health risks it poses within their home or business. Maintenance of a residential or commercial HVAC system, important for effectively removing pollutants from the air, can often be forgotten and may provide a home for these pollutions to stay present – This is why it is so important to clean the duct system in your home or business. Generally speaking, Duct Cleaning refers to cleaning out the HVAC air system and its parts. It is important to have your HVAC system maintained to keep these extra pollutants out. Even with a good filter there may be particles that sneak through the system and clump up. With pets, smoking, or high dust levels within homes/buildings, it is recommended to change the filter more often to keep the level of pollution down. 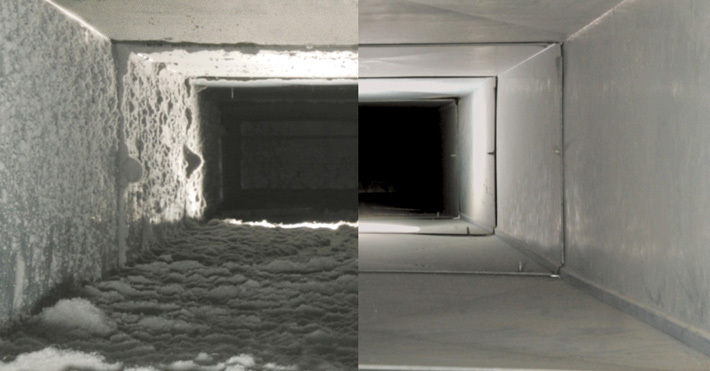 The suggested method of duct cleaning is creating negative pressure. This process draws air out of the duct system and into a HEPA filter. The HEPA filter has interlaced fibers that traps air particles as they pass through, removing contaminants from the air. An air compressor may be used to push air into the system to help push dust and particles through. Air Whips may also be used – Air Whips have flexible arms or legs that will blow air into the ducts. At the same time, the whips will beat up on the side of the duct, helping to remove stuck on dust, goop and other unfavorable materials. Once the ducts have been thoroughly cleaned out, they are fogged to deodorize and/or seal. Although the cleaning process can be completed by a home or business owner, we suggest using a professional as they are trained in what to look for during an initial inspection and have the skill set required to perform a complete and effective cleaning. This will insure that nothing is missed and your home/business air quality will stay at healthy levels.